Spring allows us to configure bean definitions in Java class. From Spring3 it supports Java configuration instead of xml based configuration. In this tutorial, we are going to implement the Spring Java Configuration. Before going to implementation, lets see the differences between the spring xml configuration and spring Java configuration. In Xml based configuration, we configure all beans in xml file with <bean> tag. Here is the typical xml configuration. 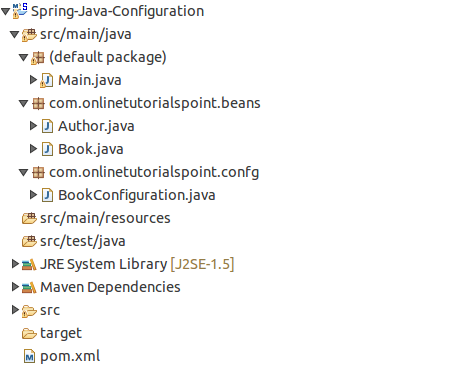 On the above xml file, we configure Book and Author beans by using <bean> tag. And all the <bean> tags are configured under the <beans> tag. Lets see, how spring Java configuration looks like for this beans. The above spring Java configuration file an exact equivalent configuration for xml file. Here we can find some new spring annotations @Configuration and @Bean. @Configuration represents the <beans> tag in xml file. @Bean annotation represents the <bean> tag. Well ! complete. Its time to run the application. Please write a spring and JSF web application example in java configuration.